Designed to be used for large clear span projects, such as Cast-In-Place projects (bridge footings, pump stations), soil remediation’s, large tank installations and linear applications, the GME Sheeting and Bracing is a cost saving system compared to traditional weld and cuts systems. Each ring consists of encased hydraulic rams and static extensions. The number of rings, which a Registered Professional Engineer determines, can be stacked on top of each other during initial installation to help speed up installation time. 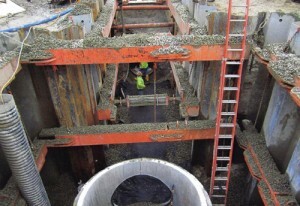 With the addition of our 100 ton and 165 ton struts, projects that exceed 60’ in length are now possible. The GME MD Brace is designed and engineered to use with a variety of steel sheet piles, enabling users to use existing sheet pile stock, saving time and money. In addition, the MD Brace system can be used in conjunction with traditional weld and cut systems. In particular, for projects that require phasing (an addition of a ring of braces, only meant to be in place for a short period), the MD Brace will save installation and removal time. With the addition of the Strut system, the GME Sheeting and Bracing system will allow users to excavate and shore system in excess of 60’ long! An enclosed hydraulic ram encased in steel. The ram, with an 1m (3’-3”) stroke, provides a working range of 2m (6’-6”) to 3m (9’-10"). 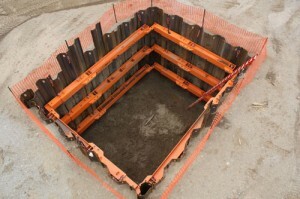 The adjustability of the MD Brace allows for rectangular and non-rectangular excavations to be safely shored. Paired with the MD Brace Hydraulic Ram, the extension is a static component that allow for an array of widths. Available in 1m (3’-3”), 1.5m (4’-11”), 3m (9’-10”), 5m (16’-4”), 7m (22’-11”) and 10m (32’-9”) sizes. Two versions are available, 100 ton and the 165 ton. The hydraulic strut allows the complete system to go to greater depths and widths then previously obtainable. Designed to be used in conjunction with the Hydraulic Strut, the extension provides extra width when needed. Serving a dual purpose, the safety chains act as a fail-safe if the system where to lose pressure and as a way to stage multiple ring spacing. A gas powered, double acting pump capable of producing 2,500 psi in both directions. The Hydraulic Pump includes two 30’ long hoses with four quick disconnect sockets. The most complete guardrail system in the industry! It serves as an extra precautionary measure, providing temporary railing around excavations and trenches. 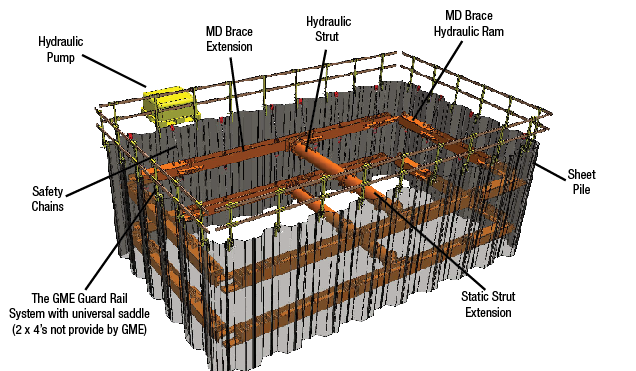 The MD Brace System by GME is designed in such a way that a wide variety of sheet pile is able to be used with the system.